Notes: Aerial view of the exhibition from the reservoir. Notes: Architects: Michigan State Building - N/A; New Hampshire State Building - N/A; Connecticut State Building - D.R. Brown, from a design by Donald G. Mitchell; Massachusetts State Building - N/A; Delaware State Building - N/A; Maryland State Building - N/A; U.S. Government Building - James H. Windrim; Main Exhibition Building - Henry Pettit & Joseph M. Wilson; Machinery Hall - Henry Pettit & Joseph M. Wilson. 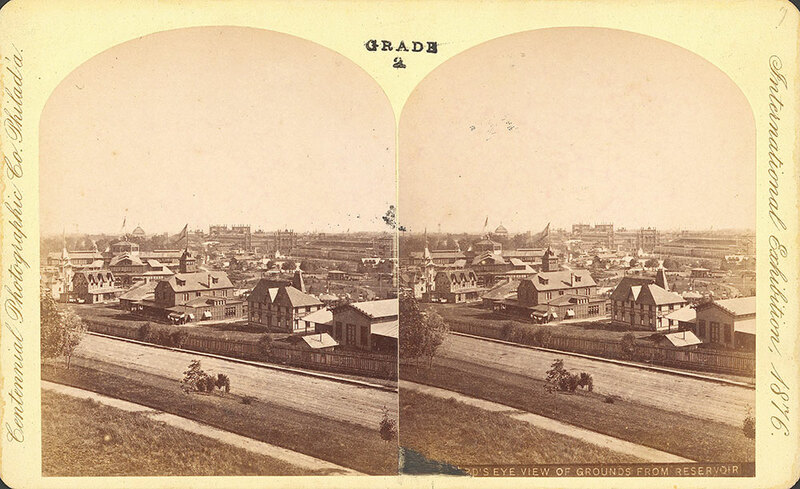 Notes: Title on damaged label: ...eye view of grounds from reservoir.